Death is hard to talk about but it will affect us all at some point during our lives. Thinking about the final days, weeks or months of our lives or the lives of those we love most can be very hard for many people and so for many reasons these conversations are often avoided or put off until they can no longer be ignored. If a patient or relative is receiving palliative or end of life care all we can hope for is that they can be comfortable, pain free and that we can make the most of the precious time they have left. If you have a patient in mind who we can help please get in contact today and speak to one of our Internal Seating Specialists for advice. Palliative care can be required by adults and children alike who face a terminal illness with no known cure. Last year the All Ireland Institute of Hospice and Palliative Care (AIIHPC) conducted a survey, which found that more than half of adults surveyed (52%) have only a basic or minimal understanding of what palliative care involves. Palliative care can be given at home, hospital, in a hospice or long term care facility. It is important for families and carers to note the patient’s wishes and so conversations need to take place whilst the patient is able to communicate their thoughts. What is Important to People Going Through Palliative Care or End of Life Care? 1. Being in the Place of Their Choice. 70% of palliative care patients would prefer to die at home. We often hear of patients who cannot be discharged from hospital until they have the correct equipment at home. In the final days we have to spend with loved ones these moments are absolutely precious. Families and patients don’t often have the luxury of time to wait for Seating Assessments or long delivery times. When I started Seating Matters this was one of my key goals – to ensure a fast turnaround of equipment to help those in need. 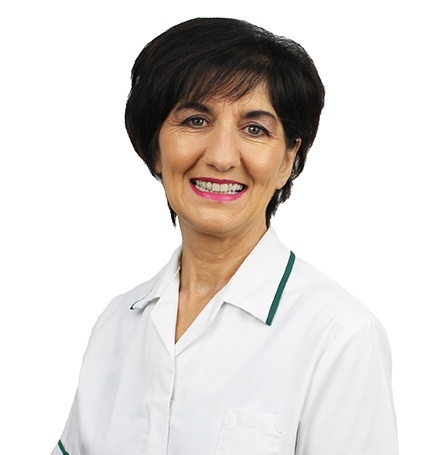 In palliative care circumstances, we endeavour to see patients as quickly as possible to complete their Seating Assessment often within as little as a few days, or evenings and weekends if it suits. 3. Being Able to Enjoy Their Last Few Days. What are the things the patient enjoys most? Being outside with the sun shining on their face? Listening to their favourite music? Talk to the patient and learn what would make them happy in their final days and see if this is something that can be arranged. It is always the simple things people seek at this point in their life. 4. Having Those Close to You Supporting You. If patients can be surrounded by their family during their final months/weeks/days it can bring a sense of comfort and fulfilment in their final moments. Support for Palliative Care Patients and their Families. An important part of palliative or end of life care is providing support for the patient and for their families. This support can take on many forms, from emotional support to financial support. Mental and physical health and wellbeing are often intricately linked and it’s important that caregivers look after their own health as well as the patient’s. It’s also very important for family carers that they have a support network to provide any assistance they need as they go through a tough time caring for their relative and having to make tough decisions. Having the correct information to hand will aid decision making and will keep all parties informed about their options. How Can Seating Make Palliative Care Easier for the Family and Patient? 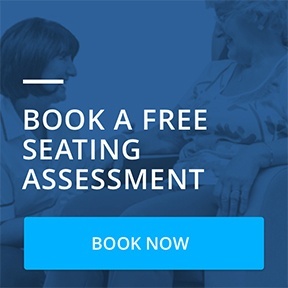 We want to ensure everyone who needs a chair to bring a relative home can get a Seating Assessment as soon as possible and we offer the option of Fast Track Delivery to speed the manufacture and delivery process up significantly. If you have a patient in mind who we can help please get in contact today. Remember that the quality of their chair determines the quality of their life. 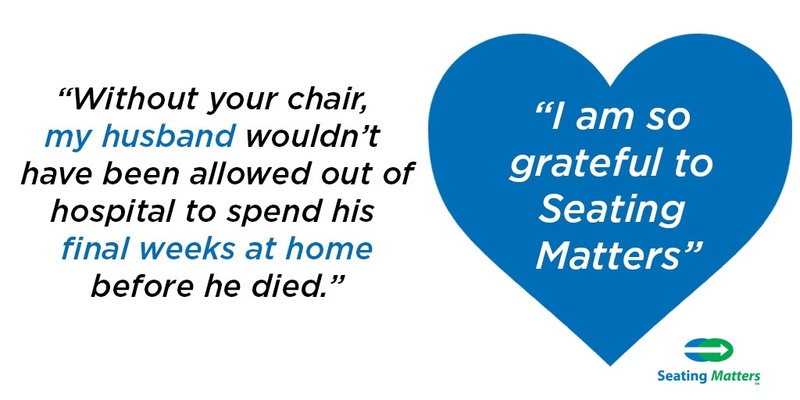 Never underestimate the impact of correct therapeutic seating in optimising comfort and reducing pain for palliative care patients, allowing them to be surrounded by family at home or in the place that matters to them most, as they live out their last days on earth. Our Seating Specialists are on hand to provide you with the information you need in order to give you confidence in your decision. They do this in an easy to understand format to give you comfort knowing that you have provided the best you can for your patient or loved one in their time of need.